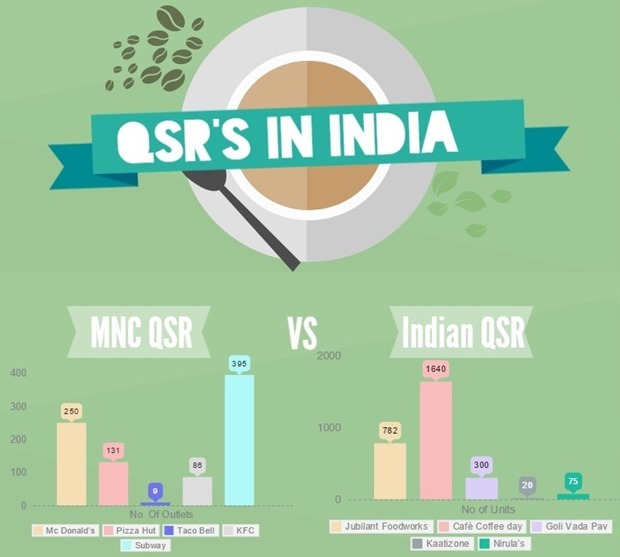 QSRs In India: Some Facts and Figures! “The way to a man’s heart is through his stomach”, whoever came up with this phrase was certainly right. With the decade seeing more women working and more disposable income, guess the proverb is skewed to, “The way to a child’s heart is through his/her stomach”. And no wonder fast food chains got the message loud and clear so much so that KFC / Mc Donald’s / Domino’s / Pizza Hut would rather fight their cases and pay the attorneys hefty amounts to stay in India because the cost of litigation is way lesser than shutting down! Fast Food chains also known as QSR (Quick Service Restaurants) are estimated to grow at 30% CAGR by 2015 as compared to 10% growth estimated for food service sector in India. Mc Donald’s and Subway are increasing their veg menus every year incorporating many traditional flavours. Mc Donald’s Masala grill, Maharaja Mac burgers, Paneer wraps, Mc spicy burgers are some of their India-only offerings. Even Mayonnaise in Indian Mc Donald outlets is free from eggs! And we certainly don’t need the statistics to know that the numbers of Mc Donald’s, Domino’s and KFC outlets have increased considerably when they start to appear every 5 km away. Foreign QSRs are slowly entering India to cash on the huge adolescent population, for example Krispy Kreme, Burger King, Starbucks and Dunkin’ Donuts debuted the QSR landscape recently. Now however, the new destination for the fast food chains is Tier II and III cities. In a report on eating habits, ASSOCHAM’s study revealed that each middle class household spend on eating out in Tier II and III cities has increased to Rs. 5,200! In metro’s this number is much higher. Also the QSR sector was the most immune to economic slowdown and made $50 billion in spite of the inflation. “A younger population, higher rate of urbanization, larger disposable incomes, higher protein consumption, increased participation of women in the workforce, and exposure to Western lifestyles are leading to the experimentation with, and adoption of, new dietary habits and more occasions to eat out for all levels of Indian society”, said Asitava Sen, head of F&A for Rabobank. Eating out is no more occasions driven, it’s more of a habit for all those below 30 years. Indian traditional fast snacks like Samosas, Vada Pav, Gol Gappas, Dabelis, Chaats, Paav bhaji whose taste is unquestionably delicious don’t have glorified outlets like Mc Donald’s due to which eating at small joints makes youngsters conscious. QSR food price ranging from Rs.100 to Rs.500 are light on pocket and QSR’s large sized outlets, music and western food seem to lure youngsters. But what goes into the food and the nutritional value have been thrown outside the window! It’s just not only the food, but also the colors that trigger hunger, psychologists say. Have you noticed how KFC is all red, Mc Donald’s is red and yellow, Coke is red too, so is Pizza Hut and Domino’s. Red is a color that triggers appetite and pushes you to go for it. “A moment on your lips, forever on your hips” still can’t get people to curb frequenting these fast food chains. The expansion of these chains shows us the change in lifestyle and attitudes among youth in dining. Alas!, it’s all for the love of eating. "QSRs In India: How Fast Food Chains Are Changing Eating Habits of Indians! ", 5 out of 5 based on 1 ratings. Is Maharashtra Govt. Considering A Ban On Ecommerce Portals?